How do moths eat our clothes? – Albie, age 5. Hi Albie, thank you for your question. Like you, I am very interested in moths, which is why I work at the Australian National Insect Collection at Australia’s national science agency, CSIRO. Maybe you asked this question because you have seen holes in your clothes and noticed buff-coloured moths (about the size of a large grain of rice) flitting around nearby. But they’re not the real culprit. Rather, it is the larva (the caterpillar of the clothes moth) that is nibbling holes in your clothes. In fact, the moth doesn’t even eat at all. The caterpillar has special jaws – what scientists call “mandibles” – and uses them to chew holes in clothes, blankets and carpets made from natural fibres like wool, felt, silk and fur. There are several species of clothes moths. For some of them, the caterpillar lives in and carries around a case that it made from fibres and faeces (its poo). So why do the larvae eat our clothes? 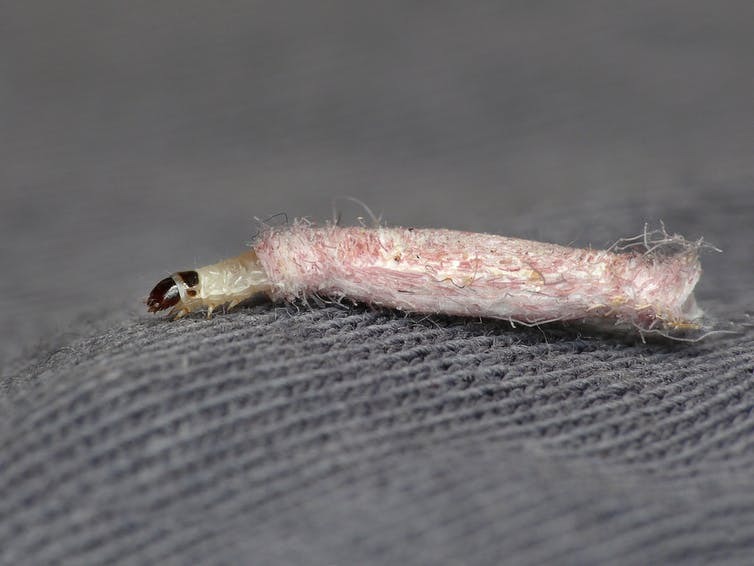 Clothes moths belong to a family called “Tineidae” or “fungus moths”, most of which feed as caterpillars on fungi, lichens and detritus – dead, organic material. Their caterpillars seem to prefer dark places and feed on fungi, rotting wood, feathers and even bat poo in Australia. Fungi occur especially in moist areas, and clothes moths seem to do particularly well in unwashed clothes that hold some moisture and might have some fungal growth (mouldy bits). Nesting materials like feathers and hairs both contain a fibrous protein called keratin. In the wild, the larvae would be feeding on those things, but when they’re in your house they can find the same protein in many types of clothes. Many clothes moths occur naturally in Europe and Asia, but have travelled with humans in their clothes to all continents, including Australia. In Australia, we have a great diversity of this ancient family of moths, with about 190 named species. But there remain many more to be discovered and described by scientists. So how do you get rid of these moths? Well, both the moth and their caterpillars prefer dark, damp places. So if you see them near your clothes, it’s a sign that it’s time to wash all your clothes and air them out in the sun. And I hope there are no holes in your favourite clothes!